The burden of proof in Apple v Samsung is increasingly lopsided. A new Samsung document submitted into evidence paints a damning picture of the company’s product review process, which compares their S1 smartphone to the iPhone and provides direct, Apple-design-specific recommendations for making their Galaxy handset better. 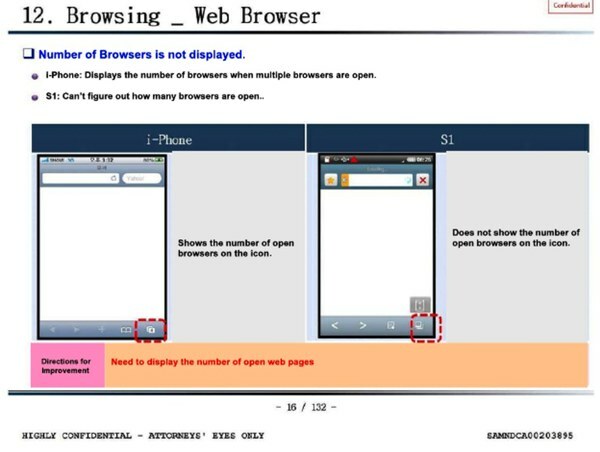 As you can see in the screen cap above, among other things, Samsung compares browser functionality in its 2010 S1 — Galaxy S, one presumes — with Mobile Safari on the iPhone and makes specific — make it more like Apple — recommendations. Moreover, it’s a long document that offers up page after page of such comparisons with the same conclusion again and again — make it more like the iPhone. And, this latest damning Apple v Samsung news builds on and expands on an earlier revelation that the iPhone caused a “design crisis” at Samsung.